My friend had lent me her dyes to shibori those socks, and while they were here I decided to use a little more of them. I got my color inspiration from somewhere on the web, and if I knew where I’d be happy to credit them, but you know how it is…you scroll around and click on this and that, and then the phone rings and you close windows and have no idea where you were. Before I measured our my 8/2 tencel warp chains, I had a brainstorm. Or maybe a bad idea. Only time will tell. I wound 3 warp chains on the mill as usual, but wound the amount needed for 2 more chains into skeins. I hand painted the 3 warp chains and the 2 skeins with the same colors, using boysenberry, chartreuse, and ice blue dyes. After they batched, steamed, rinsed, and dried I measured out the 2 skeins on my mill as usual. Here’s what the results look like. My plan is to wind and thread the loom as follows: warp painted, narrow dark strip, skein painted, narrow dark strip, warp painted, narrow dark strip, skein painted, narrow dark strip, warp painted. I’m not saying it hasn’t been done before, but I personally haven’t seen this done before. So maybe it’s brilliant, and maybe it’s a bad idea. We’ll learn together. 6 comments to Brilliant or bad idea? 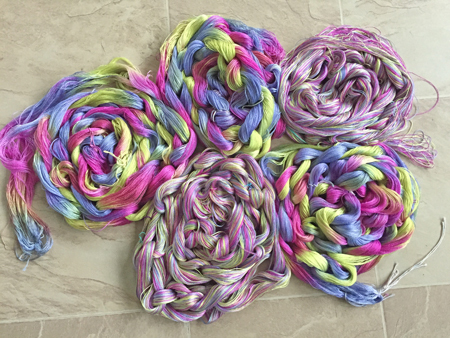 I’ve dyed warps using alone or mixing with solids, I’ve dyed skeins and mixed them with solids but I’ve never used them all together in a project – I think it’s a grand idea to try. I can’t wait to see the results! Go for it. Well, we’ll all have fun seeing how it turned out! Interesting idea for sure. Wonder what weft will work best? I’m thinking I’ll do one piece with black. Then I’ll have to make a decision for the other 2. Maybe also black with a different treadling? Maybe white? Maybe other? Only time will tell. Love this idea! Going to give it a try! Thanks, Candy. I’m threading mine now and will show it as it progresses. Let me know how yours works out!